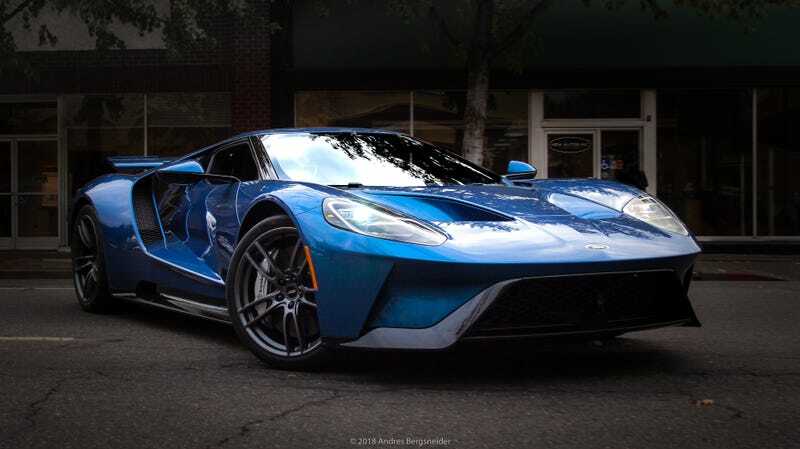 After multiple ownerships and half a year of legal battles over who or what company should rightfully own it, the 2017 Ford GT first bought by pro wrestler John Cena went to auction over the weekend in Monterey, California. It sold for $1.435 million, or nearly $1 million more than Cena originally paid for it. The car went through several owners before auction, despite Ford’s customer agreement barring the people chosen to buy the cars from reselling them for two years. Cena sold his to a dealer less than a month after he got it, and the car ended up at a dealer called New Autos Inc. in California. New Autos Inc. then delivered the car to a wealthy local farmer who preferred not to be named. New Autos Inc. later became the defendant in one of Ford’s two known lawsuits over the car—the other, of course, being Cena. Ford filed both in November 2017 and both ended in June, with Cena making a charity payment as settlement and the settlement with New Autos Inc. not disclosed. The Cena lawsuit focused on Cena breaking the customer agreement, and the lawsuit against New Autos Inc. hinged on Ford’s belief that the dealer knew about the agreement. The “farmer,” who’s 78, had the GT for nearly a year before back problems kept him from getting in and out of it easily, so he called New Autos Inc. back up to discuss selling options. He didn’t need to sell it financially, as New Autos Inc. president Bernie Knaus told Jalopnik over the phone before the auction, but he’s not the kind of person who wants a car to sit around. “He’s a guy who thinks, ‘Hey, this car should be driven. It shouldn’t be sitting there. That’s not what it was built for,’” Knaus said. Just two months after the two lawsuits ended, the GT showed up at Monterey Car Week last week in the hands of New Autos Inc.—the company that had just settled its legal trouble over selling the car in the first place. Knaus told Jalopnik the GT eventually sold for $1.435 million at a Russo and Steele auction on Saturday, and Automotive News has video of the sale here. That’s a chunk less than the nearly $1.7 million a GT at Mecum went for earlier this summer, which Mecum is still in a lawsuit with Ford over, but it’s more than triple the $460,000 Cena paid for it. It sold with about 625 miles on the odometer, Knaus told Jalopnik, compared to the 30 it had when he got it. Both Cena and New Autos Inc.’s settlements with Ford were “dismissed with prejudice,” which means, legally, that “the plaintiff can’t bring this same case back to court.” That, to Knaus, meant this car was now free to pass through the used market like almost any other vehicle, and he told Jalopnik he didn’t regret getting his customer the car in the first place. “I don’t feel bad about getting him a car on the secondary market, because by doing that, I felt like we righted a wrong,” Knaus said, adding that the farmer runs his entire, large operation with Ford trucks and personally owns a 2005 GT. “We got that car in the right hands for the man who deserved it, and he even had to pay a premium for that. That’s exactly the line the auction opened up with in the video from Automotive News—the first unencumbered Ford GT, ready to sell, presumably, free of any legal repercussions.